Pat Mulrooney and dog Bruno along the Howe Sound Highline. The human capacity for adaptability never ceases to amaze me. It seems the more difficult goals you aim for and the more you push your pain and comfort levels aside, the more normal non-normal things become. Over the last couple of years, without even realizing it, huge hike-a-bike missions have become strangely common for me. Ever since my first visit to Britannia, I’ve been obsessing about spending a night high on an alpine ledge overlooking Howe Sound. It’s a spot I gaze up at each morning from my front porch in Squamish while enjoying my first coffee of the day. It’s the true high point of a still-quite-unknown bike trail network. What could be better than waking up in this inspiring place and dropping into a 1,850-metre line that terminates at the ocean? What better time than now? We left at the crack of dawn, knowing that much of the first four hours would involve a solid, keep-your-head-down push. Located between Vancouver’s North Shore and Squamish, the fjord walls above Howe Sound share terrain and forest characteristics with each of those zones. Much of the terrain is very steep and holds some of the longest granite slab lines in the Sea to Sky corridor, with artistically sculpted trails weaving through a thick moss carpet beneath a canopy of old growth fir and west coast cedar giants. 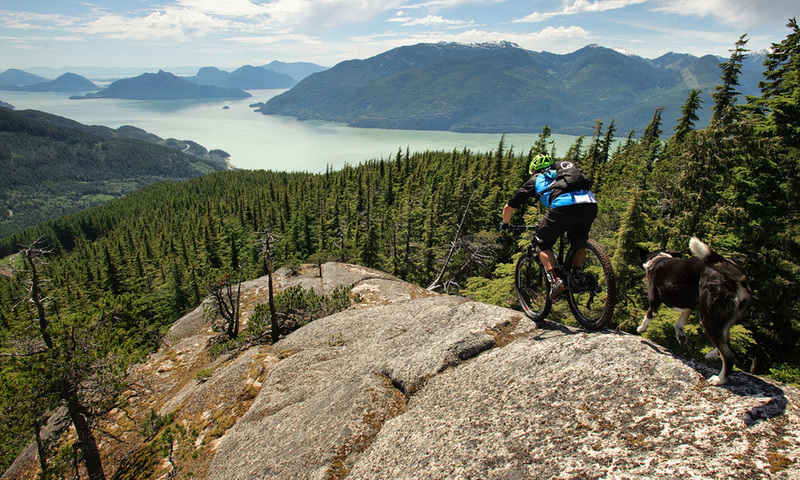 It’s as if Squamish, North Vancouver, Whistler and Pemberton were mixed in a blender to create the perfect riding elixir. This is where loam dreams come true. . .
It’s also a place where the phrase “earn your turns” is taken to another level and the challenges come often and in very interesting ways. This was one hottest days in July and we were lugging 40-litre packs stuffed with overnight essentials. The summer mosquitos and black flies took advantage of our slow uphill pace — we bled for this one. But dream rides rarely come easy and I knew it would all be well worth the effort. Sure enough, the grade eventually eased and we were able to pedal alpine single-track sections on the final stretch to the top. Once we gained the ridge, 270-degree views opened up and the ride became a bit of a Mount Garibaldi and Howe Sound photo shoot. After spending the better part of the day exploring all the small alpine tarns and reaching the end of the ridge, we set up a bivy. From this overhanging, rocky ledge we could clearly see our house on the Squamish River and we pitched camp on the very spot I’d been staring at for one too many mornings. As we watched the sun set, we admired the kite boarders on the sound while the Tantalus Range lit up high above them. I’m not sure we could have had better views of Garibaldi, Habrich and Sky Pilot. The evening was a spectacular, star-filled Squamish night. The next morning we woke at 5:00 a.m. to a fog-covered Howe Sound with all the peaks rising mightily above. I relished this a while, the view from the top of my regular morning view, and then we packed up and set off on a 1,850-metre descent. Having ridden this trail network for nearly 20 years, I knew I was in for a smorgasbord of all the things we dream about as mountain bikers and the landscape delivered again. It’s rides like this that make us realize just how special our Sea to Sky backyard is, and how lucky we are to live amongst these mountains that challenge our everyday normal to greater levels.